baseball is soccer…also played basketball and soccer in his youth…originally signed by Atlanta scouts Rolando Petit and Julian Perez. 2018… it was T16th-longest in Texas history, longest since an Adrián Beltré 19-G run from 7/16-9/15/11…in 2017, his .354 BA (28-79) in close and late situations ranked 5th in the A.L…his .293 (225-767) career avg. in close-and-late PA's is 8th-best in majors since 2009 (600+ AB's), including ranking 2nd in MLB with .318 (90-283) mark since start of 2015 (min. 200 AB)… only player ahead of him in that span is Adrián Beltré (.322). Started 158 of 162 games // 157 at SS, 1 as DH…made starts in every spot in the batting order, just the 4th player in Rangers history to accomplish that feat (others // Billy Sample in 1983; Mike Hargrove and Ken Henderson in 1977)…his 2017 included first 4 starts ever in cleanup slot // 4/23 vs. KC, 5/4 at HOU, 5/5-6 at SEA…became just the 15th player in ML history (since 1933) to have 100+ H, 20+ 2B, 20+ SB, and 50+ RBI before the All-Star break in a season, and just the 4th on the list to not be selected for that year's ASG (others LAA's Devon White in 1987, CIN's Bobby Tolan in 1972, and CIN's Vada Pinson in 1963)…Andrus was part of the A.L. ASG Final Vote last season, which was won by KC's Mike Moustakas. Established career highs in the slash categories with a .302 average, .362 OBP, .439 SLG, and .800 OPS in 2016…also had career highs in home runs (8), RBI (69), and extra-base hits (46), all while posting his fewest strikeouts (70) in any season…the team-high .302 avg. was 10th in the A.L., his 1st career .300 season, 2nd highest among ML SS (LAD's Corey Seager-.309)…his .800 OPS ranked 2nd among Rangers (Beltre-.879) and 3rd among A.L. shortstops to only HOU's Carlos Correa (.804) and BOS' Xander Bogaerts (.802)…had 222 total bases, 2nd-highest total of his career (238 in 2012)…according to STATS LLC, Andrus' line drive percentage of 26.2% was the highest of his career, highest among qualifying Rangers, and 13th-best in the A.L…ranked among A.L. leaders in triples (T3rd, 7), sac flies (T5th, 7), stolen bases (T7th, 24), average vs. LHP (1st, .348), average with RISP (1st, .378), and plate appearances per strikeout (10th, 8.1)…twice won Rangers Player of the Month honors (April and Sept./Oct. ), 1st such selections in his career. Has started each of Rangers' 42 playoff games since 2010 at shortstop, T2nd-most games for any A.L. player in that span (52-Mike Napoli, 42-Josh Hamilton)… is Texas' all-time postseason leader in hits (46), steals (9), games, multi-hit games (14), and at-bats (173), and ranks 2nd in runs (21) to Nelson Cruz (26)…had team-high 4 hits in 2016 ALDS loss vs. TOR, hits in all 3 games, and has an active 10- game postseason hit streak in Arlington (.390, 16-41)…hit lone postseason HR in 2016 ALDS G3 at TOR, the only such HR ever by a Texas SS, which had been the only position (outside of pitcher) without a playoff HR for the Rangers…had hits in 3 of 5 games in 2015 ALDS…went 2-for-4 in club's loss to BAL in 2012 A.L. Wild Card Game…in 2011, batted .235 (16-68) in the 17 playoff games, hitting safely in 11 of those…was 2-for- 14 in ALDS vs. TB, a pair of singles in Game 3…batted .240 (6-25) in the 6-game ALCS vs. DET with lone stolen base of postseason coming in Game 6…had a .276 (8-29) average in the World Series against STL, hitting safely in Games 2-6… scored the winning run in top of 9th of Game 2…was team leader in at-bats (68), hits (20), and steals (8) in 2010 playoffs, as 8 SB remain T5th-most ever in a single postseason…had a .294 overall average with 4 RBI…hit safely in each of 1st 12 playoff games (5-ALDS; 6-ALCS; 1 WS) at .333 (18-54), tying 3rd-longest hit streak to begin postseason career in baseball history…matched Nelson Cruz for most hits in the ALDS (8), youngest player to lead or tie a playoff series in hits since Mets' Gregg Jeffries had 9 at age 21 in 1988 NLCS vs. the Dodgers…had steal of home on double steal in the 1st inning of ALCS Game 2 vs. NYY, the 1st steal of home in a playoff game since ANA's Brad Fullmer in Game 2 of 2002 WS vs. SF. After a slow start to the year, Andrus rebounded and was a key part of the offense in the Rangers' surge to the postseason…for the year, batted .258 (154-596), setting career highs with 7 HR and 160 games, adding a team-high 34 doubles along with 62 RBI…compiled his highest OPS (.667) since his All-Star season in 2012 (career-high .727) and posted 2nd-most total bases (213) in his career (238 in 2012)…career lows in average, on-base pct. (.309), and pitches per PA (3.69)…had a team-high 159 starts, appearing in all but 2 games for Texas. In his 6th ML season, led Rangers in games (157), plate appearances (685), at-bats (619, 8th in A.L. ), singles (tied-125), doubles (career-high 35, T10th in A.L. ), sac flies (7), and sac hits (9, T4th in A.L. )...joined Michael Young (2005-06-07-08) as only Texas shortstops with at least 35 doubles in a season...ranked 2nd on team in runs (72), hits (163), and total bases (206), finished 3rd in walks (46) and extra-base hits (38), and was 4th in RBI (41)...the 72 runs tied a career low (also 2009)...team-high 21 GIDP's, T3rd in A.L. and T9th-most in a season in club history...his 38 extra-base hits were 2nd-most of his career (43 in 2012), but had career-low one triple after 3+ triples in each of his first 5 seasons...his .263 avg. and .314 OBP in 2014 were both career lows...started 152 games at short and 4 at DH. Led the A.L. in singles (143) and sacrifice bunts (16) and tied for 3rd in steals (42)…topped the Rangers in runs (91), walks (52), and stolen bases, was 2nd in games (156), at bats (620), and hits (168), ranked 3rd among qualifiers in on-base percentage (.328), and was 4th in batting (.271)…set career highs for RBI (67), steals, sac flies (6), and strikeouts (97)… was the only ML player with at least 90 runs, 60 RBI, and 40 steals… started 145 games at short and 10 as the DH…played for Venezuela in World Baseball Classic, going 2-for-7 with 2 RBI and 2 stolen bases in 2 games. Had the best offensive season of his major league career, ranking 2nd in the A.L. in triples (9), singles (137) and infield hits (38), all team bests, while also placing among the league leaders in at bats (T6th, 629) and hits (11th, 180)...was among the Rangers leaders in games (2nd, 158), at bats (2nd), hits (2nd), stolen bases (2nd, 21), average (3rd, .286), and runs (5th, 85)...established career highs for batting average, games, at bats, hits, total bases (238), doubles (31), triples, and extra base hits (43)...tied for the 4th-most triples in Rangers history, most since Michael Young had 9 in 2004...was one of 7 A.L. hitters with at least 60 RBI, 80 runs scored, and 20 stolen bases...started 154 games at shortstop and 4 as the DH...SELECT COMPANY: Andrus batted .286 with 180 hits and 62 RBI in 2012...over the last 9 seasons since 2004, the only other A.L. shortstops with minimums of a .285 average, 180 hits, and 60 RBI in a season are Derek Jeter (5 times), Michael Young (4), Miguel Tejada (3), and Orlando Cabrera (1)...BATTING: Had a .230 average in his 1st 15 games through April 22 before batting .382 (39-102) over next 26 games, improving to .325 on May 20...hit .213 (17-80) over next 20 games through June 13 before batting .313 (86-275) in next 68 contests to give him a .301 mark through Sept. 2...hit .216 (24-111) in final 29 games...produced a season-best 4 hits on 3 occasions: May 13 and August 1 vs. LAA, and August 19 at Toronto...posted a season high 13-game hitting streak, July 7-25; an 11-game streak, April 30-May 11; and a 10-gamer, June 23-July 3...5th in the A.L. with runners in scoring position at .350 avg. (49-140) and ranked 4th in the circuit with a .319 mark in the 7th inning or later...in win May 13 vs. LAA, had 3 hits with RISP...his .316 (24-76) avg. in late and close situations was best among Rangers and 11th in A.L...had similar home/road splits in most categories, posting .287/.346/.373 at home and .286/.351/.384 on the road...was 2nd hitter in the order for a 2nd straight year, with 149 starts in no. 2 spot and 5 starts as leadoff man...despite ranking 3rd on club with 57 walks, had 2 longest walk-less streaks of his career: 19 games (Aug. 17-Sept. 7) and 15 games (Sept. 13-28)...MISCELLANEOUS: Had career-high 32-game on-base streak from April 9-May 14, longest in A.L. and tied with the Cubs' Brian LaHair (April 8-May 15) for longest such streak in the majors in 2012...reached base safely in 37 consecutive starts, April 20-May 20...matched career high with 4 runs scored on May 8 at Baltimore, when he was on base for all 4 Josh Hamilton home runs...had A.L.-high 22 runs in May, 2nd-highest monthly total of his career (24 in May 2010)...his 10th inning RBI single gave Texas an 11-10 victory on August 1 vs. LAA after club trailed 6-0 in the 3rd inning...became the first Ranger ever with a triple and another extra-base hit (2B) in one inning on Sept. 14 vs. Seattle (8th)...had a sac bunt in 3 straight games, Sept. 22-24, T2nd-longest streak in team history...was 6-for-17 (.353) in 4 games as the designated hitter...only months with more than one non-start were May (2) and August (3)...played for Magallanes in Venezuelan Winter League, batting .234 (15-64) with a homer and 8 RBI in 17 regular season games and .325 (25-77) with 2 HR, 6 RBI and 18 runs in 23 playoff games. Playing the majority of the year at age 22, was among theA.L. leaders in sacrifice hits (3rd, 16), caught stealing (T4th, 12)and stolen bases (37)...ranked among team leaders in steals (1st),hits (2nd, 164), runs (2nd, 96), games (150), at-bats (587), walks(3rd, 56), on-base percentage (3rd, .347), and batting (4th, .279)...established career highs in average, runs, RBI (60), doubles (27),stolen bases, games, on-base pct., total bases (212), and OPS(.708)...after hitting leadoff for most of 2010, batted in the 2nd position for most of year with just 9 starts in the top slot...his 96 runswere the 2nd-most of any ML shortstop (Jose Reyes, 101), theyoungest player to score at least 96 runs since Carlos Beltran in1999...only younger Ranger with that many runs was RubenSierra, who was 21 when he scored 97 runs in 1987 (age as ofJune 30)...also ranked 2nd among A.L. shortstops in walks. Led the Rangers in walks (64) and ranked among clubleaders in games (3rd, 148), runs (3rd, 88), hits (4th, 156), and hitby pitches (T3rd, 5)...averaged 4.02 pitches per plate appearance,2nd-best among Texas regulars (Murphy-4.08 P/PA)...placed 4thin the A.L. with a .347 (42-121) average with runners in scoringposition, batting .500 (13-26) in that situation through May 17...moved into the leadoff spot on April 18 at Yankee Stadium andmade each of his final 133 starts batting 1st...among A.L. leadoffbatters, ranked 2nd in walks (58) and T4th in runs scored (86). BATTING: Had a .331 average (45-136) over 1st 38 gamesthrough May 18, his highest figure all year after season's 1st 10games...hit .213 (26-122) in next 28 games from May 19-June 20,dropping to .275...hit safely in final 8 games in June at .455 (15-33) to rise from .275 to .296...beginning July 1, hit .236 (70-297)over final 74 games...became just the 3rd Ranger with 3 hitstreaks of at least 13 games (14 games, April 28-May 14 and Aug.8-24; 13 games, May 23-June 8), joining Ruben Sierra (3 in 1991)and Michael Young (3 in 2008) ...only other players with multiplehit streaks of 13+ games in 2010 were Ichiro Suzuki, Miguel Cabrera,Mark Ellis, Matt Holliday, and Corey Hart (all 2 each) with OrlandoCabrera in 2009 with Oakland and Minnesota the last with3 such streaks in one year...matched career high with a pair of 4-hit games, May 13 vs. Oakland and July 30 at Los Angeles (AL)...had 3 hits on July 18 at Boston to snap 0-for-26 drought. ALL-STAR: Selected to 1st All-Star team via player voting, finishing2nd to the fan-elected Derek Jeter...at 21 years, 10 months wasTexas' 2nd youngest All-Star ever behind Ivan Rodriguez (20 years,8 mos.) in 1992...pinch-ran for Jeter at 1st base in the 6th inning ofJuly 13 game in Anaheim and was caught stealing by Brian McCannon a strikeout by Paul Konerko, the next batter...grounded outagainst Brian Wilson in 8th inning in A.L. 's 3-1 defeat. POSTSEASON: Started all 16 playoff games at shortstop, hitting.294...at 22 years, 44 days on day of Game 1 of ALDS, was theyoungest Ranger to ever appear in a playoff game...was team'spostseason leader in at bats (68), hits (20), and steals (8) andranked 3rd in average and runs (8)...tied for 5th most steals everin a single postseason...hit safely in each of 1st 12 playoff games(5-ALDS; 6-ALCS; 1 WS) at .333 (18-54) before going 2-14 in final4 games of the fall classic...matched 3rd longest hit streak to beginpostseason career in history...fielded .957 (3 E/69 TC).Was 8-for-24 (.333) in the ALDS against Tampa Bay with 2 hitseach in Games 2, 4, and 5...matched Nelson Cruz for most hitsin the series, youngest player to lead or tie a playoff series in hitssince Mets' Gregg Jeffries had 9 at age 21 in 1988 NLCS vs. theDodgers...after 1st inning leadoff single and stolen base scoredall the way from 2nd on Josh Hamilton groundout for Texas' 1strun in 5th and deciding game...also hit .333 (9-27) with 4 steals inALCS versus New York...had a pair of hits and 2 SB in Game 2,including steal of home on double steal in 1st inning...was 1st stealof home in a playoff game since Anaheim's Brad Fullmer in Game2 of 2002 WS vs. San Francisco...went 3-for-5 in Game 4...was3-for-17 in World Series vs. the Giants with 2 hits in Game 3. MISCELLANEOUS: Exited in 3rd inning Sept. 4 at Minnesotawith tightness in right hamstring, and missed final 5 games of roadtrip Sept. 5-9, his 1st time to miss consecutive starts in his bigleague career (2009-10)...hit a walk-off bases loaded single in the9th inning on April 23 vs. Detroit on night Rangers were honoringElvis Presley...at 21 years, 8 months, was youngest Texas playerwith a walk-off hit since Ivan Rodriguez on May 24, 1992...had 54runs scored in 1st 74 games through end of June (0.73 R/G), butjust 34 runs in final 74 games (0.46 R/G)...went 23 games withoutan extra-base hit, June 9-July 4, longest streak by a Ranger sinceMichael Young went 24 games, June 16-July 15, 2007...had 2extra-base hits (doubles) over final 39 games beginning Aug. 13...did not play winter ball after 2010 season. In first major league action, ranked among AmericanLeague leaders in sacrifice bunts (T4th, 12), triples (T5th,8), stolen bases (6th, 33/9th in majors), and bunt hits (T7th,6)...led club in triples, steals, sac bunts, bunt hits, andinfield hits (19) and ranked among team leaders in hitsgames (2nd, 145), singles (2nd, 97), hit by pitches (T2nd,6), hits (4th, 128), runs (4th, 72), times on base (4th, 174),runs created (5th, 63), walks (6th, 40), and total bases (7th,179)...averaged a GIDP every 120.0 at-bats, the third bestratio among qualifying A.L. players...his 2.46 ground ball/flyball ratio was fifth best in the majors and 2nd-best in the A.L., trailing only Derek Jeter (2.63) in that category. The youngest player to appear in the Texas League all season, Andrus batted .295 with 4 home runs, 19 doubles, 82 runs, 65RBI, and 54 stolen bases in 118 games with Frisco (AA)...rated by Baseball America as league's best defensive shortstop and no. 5prospect after the season...ranked as one of the top 40 prospects in baseball by both Will Lingo (no. 32) and John Manuel (no. 37)at that publication...also rated as a top baseball prospect by both ESPN.com (no. 39) and MLB.com (no. 21)...had play hamperedand missed 16 days after suffering a fractured finger on his right hand in late May, but did not go on the disabled list...his career-high54 steals led all players in the Rangers organization and ranked 2nd in the league...his .295 average ranked 4th in the TexasLeague...despite the missed time and appearing in fewer games than 2007, still established career bests in average, runs, hits, andRBI...was starting shortstop for the World Team in the 2008 Futures Game at Yankee Stadium on July 13, going 0-for-1 with a walk,stolen base, and run scored...went 0-for-3 for South Team in Texas League All-Star Game on June 25 in Springfield, Mo., a 7-3 Southwin in 10 innings...also selected to the Texas League Postseason All-Star team. Split season with pair of High-A clubs, combining to bat .257(127-495) with 5 home runs, 22 doubles, and 49 RBI in 126 gamesfor Myrtle Beach in the Carolina League and Bakersfield in theCalifornia League...established career highs in games, at-bats,runs (78), hits, total bases (170), walks (54), and stolen bases(40)...he was the youngest player in the Carolina League, 4thyoungestin the Cal League...he was the 8th-youngest player toappear in the top 3 levels of the Minor Leagues in 2007, and morethan doubled the number of games played by any other player onthat list...Andrus was the youngest player in the Minors to spendthe duration of the season at the High-A level or better...over final 31 games combined in the two organizations, batted .315 (40-127)to raise final average from .236 to .257...hit primarily second in batting order the entire season...batted 100 points higher in roadgames (.301, 83-276) vs. home games (.201, 44-219)...was successful in 22 of his final 25 steal attempts with Myrtle Beach, includinga stretch of 16 straight without being caught from May 4-June 12...had 3 steals on June 1 (G1) at Frederick...selected to WorldRoster for Futures Game on July 8 in San Francisco, going 0-for-2...pinch-hit in 5th and grounded out to short against Luke Hochevar,then struck out swinging against Clayton Kershaw in the 7th and final inning...made his Bakersfield debut on Aug. 1 at Visalia, theday after the trade was finalized, going 0-for-5...went just 4-for-21 (.190) in his first 5 games with the Blaze, but would bat .326 (29-89) the rest of the way...went 4-for-5 on Aug. 15 at High Desert, posting season highs for hits and runs (4)...had no errors in last 13games for Blaze...named to Arizona Fall League's Top Prospects Team after batting .353 (18-51) with a .411 on-base pct. for WestDivision champion Surprise Rafters...hit safely in 12 of 15 games for Surprise despite being youngest player in the league...named3rd-best prospect in the Carolina League by Baseball America after the season...was rated no. 65 on Baseball America's Top 100Prospects prior to the season. Earned MVP honors for the Gulf Coast Braves (Rookie)...led the club in hits (49), on-base pct. (.377),stolen bases (7), runs scored (26) and walks (19)...reached base safely via hit or walk in 35 of 46 contests...was honored by theBraves organization as GCL July Player of the Month when he batted .351 (27-77) with 15 RBI...his overall .293 average was ninthbestamong Braves minor leaguers...earned promotion at end of year to Danville (rookie) on Aug. 29 and hit .400 in the AppalachianLeague championship series....selected as Braves' second-best overall prospect by Baseball America following the season. June 18, 2018 Texas Rangers activated SS Elvis Andrus from the 60-day injured list. June 16, 2018 Texas Rangers sent SS Elvis Andrus on a rehab assignment to Round Rock Express. June 11, 2018 Texas Rangers sent SS Elvis Andrus on a rehab assignment to Frisco RoughRiders. May 2, 2018 Texas Rangers transferred SS Elvis Andrus from the 10-day disabled list to the 60-day disabled list. Right elbow olecranon fracture. April 13, 2018 Texas Rangers placed SS Elvis Andrus on the 10-day disabled list retroactive to April 12, 2018. Right elbow olecranon fracture. July 8, 2017 Texas Rangers activated SS Elvis Andrus from the paternity list. July 5, 2017 Texas Rangers placed SS Elvis Andrus on the paternity list. May 18, 2016 Texas Rangers activated SS Elvis Andrus. May 17, 2016 SS Elvis Andrus roster status changed by Texas Rangers. October 7, 2014 SS Elvis Andrus assigned to Navegantes del Magallanes. 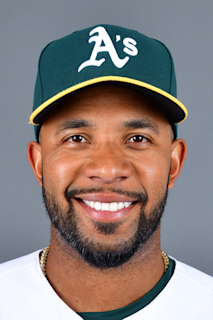 November 19, 2012 SS Elvis Andrus assigned to Navegantes del Magallanes. October 7, 2009 SS Elvis Andrus assigned to Navegantes del Magallanes.